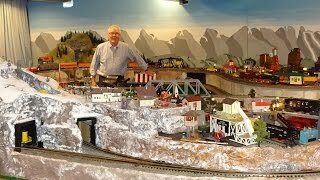 Ron Stevenson shares his awesome Lionel O Scale / Gauge Model Railroad train layout. Ron’s passion for trains started as a 10 year old boy when Santa brought him a Lionel train set for Christmas in 1952. He’s collected Lionel trains from that day forward. Today his collection has many original Lionel buildings from the 1950’s. This layout includes several city environments, bridges over water, and a ski mountain! Every area on the layout is complete. The engines, cars, and scenery on the layout are of the highest quality, all add realism, and just a wonderful experience to view. @2018 - modeltrainexpress.com. All Right Reserved.